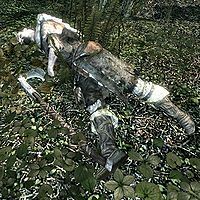 Wood Cutter is the corpse of an Imperial citizen. 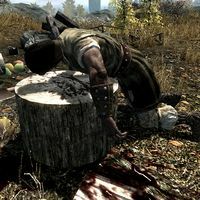 He is lying on top of a tree stump at a bandit camp just off the road to the southeast of Ivarstead. He wears a set of farmer clothes with hide boots and bracers. There is a slim chance that he carries a small amount of gold and/or a lockpick. Wood Cutter is the corpse of a Breton bandit wizard. He is located in the wilderness to the east of Shriekwind Bastion, to the south of three fallen trees that are south of the road. He wears a set of fur armor and randomly determined, leveled footwear; at all levels, there is always a 50% chance he will wear a pair of fur shoes while the other 50% can differ; at level 1-5 it can be hide boots, at level 6-18, it can be leather boots, and at level 19-28 it can be scaled boots. He always carries an iron dagger and a few random potions, and has a slim chance of carrying a bit of gold and/or a single lockpick. Additionally he also knows a variety of spells, even if he never gets to use them—specifically Lesser Ward, Healing, Oakflesh, and the three Destruction spells Flames, Frostbite, and Sparks. He also has a constant effect of Recover Magicka. A few feet away from the second wood cutter's body, the unique axe The Woodsman's Friend can be found in the forest floor.